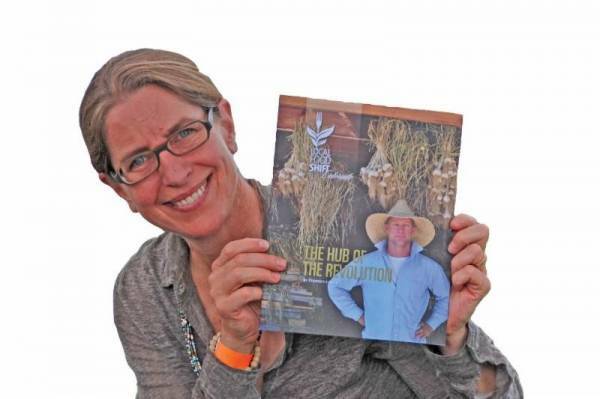 Associate Publisher Nanna Meyer, above, holds a copy of a special preview edition of Local Food Shift magazine, which features an in-depth article about Avondale grower Dan Hobbs and how he helped to launch the first food hub in Southern Colorado. (You can find organic seeds from the Hobbs Family Farm for sale at Ranch Foods Direct.) The magazine’s first full-scale issue is due for release during the first week of September! To subscribe, go to LocalFoodShift.org. This summer our friends at Colorado Collective produced the first sample print edition of their beautiful online magazine dedicated to makers, crafters, doers and entrepreneurs in Southern Colorado. Copies are for sale for $10; order yours by visiting the CoCo website. CoCo has also been hosting a series of summer farm dinners… the final one in the series will feature nose-to-tail cooking by Chef Kevin Campbell and is slated for Sept. 26. They are calling it the party of all parties! Tickets are $68 each and can be purchased at the CoCo website. Dinner info is provided under the tab entitled The Collective Plate. Tickets go on sale Aug. 15.